After doing a race many runners like to include an alcoholic drink in their recovery. It’s an opportunity to relax with friends and to celebrate your achievement. But some races actually factor in some drinking during the race. Many of you will have heard of the Marathon du Medoc in France, which boasts 23 aid stations serving some pretty fine wines to the runners, as they weave their way through vineyards in the Gironde. The emphasis is clearly on enjoying the day, not on setting a PB, and most runners done fancy dress to do the race. 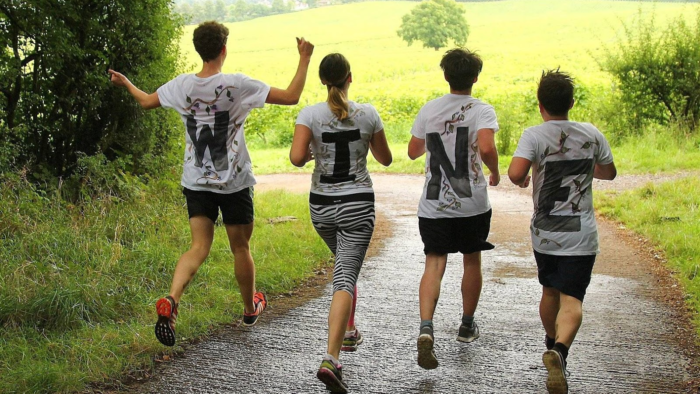 It’s become a must-do race for those who like their wines fine and their run fun. 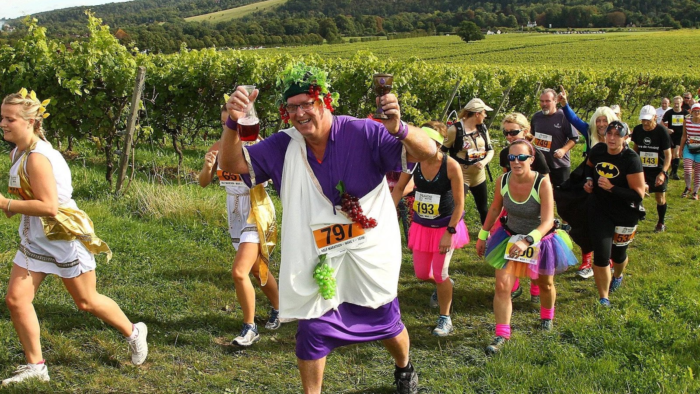 Not to be outdone by the French in the sophistication stakes, we have our own version of the Marathon du Medoc in the UK – the Bacchus Marathon. Just like the French race the emphasis is on fun, most entrants don fancy dress, there’s live music and, obviously, there is wine. The five ‘refreshment’ stations dotted around the course serve 6 English wines and, as it’s a two lap course for the marathon, those runners get to enjoy twice the amount of wine as the half marathon entrants. 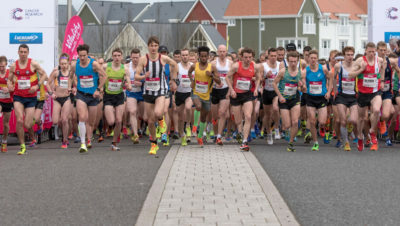 A fantastic new addition for 2019 is the introduction of the shorter 10km event, where participants can either run, jog or walk the route, visiting one wine sample station along the way. 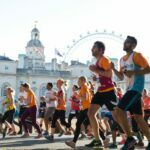 Children are also able to participate in a Two-Mile Fun Run, ensuring that Run Bacchus caters for the whole family, with entry for the children’s event free and each finisher will receiving a medal. At the end of the race, the fun doesn’t stop as runner’s are greeted at the finish line by a post-race hog roast (and more wine), extending the activity long into the evening. ‘The race takes place on Sunday 8th September 2019 and you can enter HERE. White Star have long organised fantastic races with personality, from the Larmer Tree races to the Dorset Invader to Giant’s Head Marathon. They are all in beautiful areas of Dorset and the courses are testing. Some also boast ‘Lovestations’ which is their version of an aid station with a lot of love and some booze thrown in. I did the Larmer Tree Marathon a few years ago and I can confirm that buck’s fizz is an excellent mid-race refreshment. They also organise the ‘Cider Frolic and Piggy Plod’ around a cider farm. 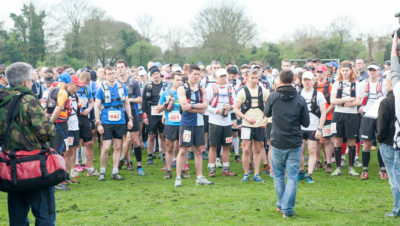 Runners rave about White Star events because of their atmosphere, inclusiveness and the sociable post-event get-togethers over a hot meal (and maybe a drink). Find out more about White Star Races HERE. If you want low-key races with an emphasis on fun then you will love them. If whisky is your thing how about trying one of the Dramathon races, which take in several Scottish distilleries along the route on Speyside. Choose from the Full Dram, Half Dram, Wee Dram or We Dram relay (I love this already). Runners pick up miniatures from the distilleries at the end of the race, to enjoy at their leisure. The routes just look stunning and it sounds like a fun event. Find out more HERE. If you’re a connoisseur of fine food as well as fine wine, you might enjoy the Marathon du Malton. It’s actually a 10k and Malton is seen as one of the UK’s premier gourmet hotspots, so this race is billed as ‘Britain’s tastiest 10k’. Treats on offer at the eight aid stations include craft beer, gin and mini Yorkshire puddings with roast beef! Find out more and enter HERE. Of course nobody is advocating drinking heavily while running. These races are all about having a small tipple while having a fun, social run. And of course the drinking part is all optional. You can just take in the atmosphere, enjoy the food and have a great day out!